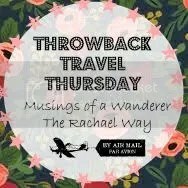 I have been checking out the Throwback Travel Thursday link up on The Rachael Way Blog last week and although it’s a week late (!) thought it would be good to look back at other countries I have visited and loved. Our visit in 2008 was probably my favourite as it coincided with my birthday! We visited St Catherine’s Monastery where the Burning Bush is said to be. It was a an hour or two outside of Sharm el-Sheikh and along the way we saw some frankly amazing sights as well as stopping so this guy could try to sell us his wares. The Monastery is at the top of a large hill/small mountain which you have to walk up unless you brave a camel ride or pay one of the taxi drivers to drive you up. The walk was tough at times but when you reach the top the building is pretty stunning. On the way back we were taken to a bedouin camp where we ate traditional and very tasty Egyptian food. On my birthday me and my Mum spent the morning snorkelling in the sea right next to our hotel and got to see some pretty fish before lunch and the best part of the day which was a star-gazing night in the middle of the desert. Again our journey was around an hour by coach where we were taken to another Bedouin camp. There we walked up into the mountains to watch the sunset. After the sunset we were invited to have dinner with the Bedouins and were shown how to make bread before paying a visit to their shops. After dinner an astronomer from a university in Israel had us all lie down on a blanket to enjoy some stargazing as he pointed out the constellations. We were able to look through a pretty spectacular looking telescope and view Jupiter. I was frankly blown away by this day as it was and then somehow (Dad!?!) the tour guide found out it was my birthday and so everyone sang Happy Birthday to me before being dragged up to “dance”. When we got back to the hotel I was also spoilt by the hotel as they had baked me a cake as well! On our second trip in 2010 we went on a tour around the Sharm el-Sheikh area which included visiting a local Mosque as well as a trip to the markets at sunset. As I enjoyed snorkelling so much on our last trip we went on a boat trip to the coral reef in the Ras Mohammad National Park which was a lot of fun. Our last night in Egypt on this trip was interesting as it rained, and apparently Eqypt only gets rain once every twenty years or so and this definitely made up for the lack of rain as it hammered down, delaying our flight by 24 hours. Until I arrived in Darwin I don’t think I had ever seen so much rain. It knocked out the phones, electricity pretty much everything! I couldn’t talk about visiting Egypt without mentioning the beautiful sunset and sunrises. I woke up early a few days to wander down to the beach to see the day starting and was never disappointed.